Next time you start a new decorating project, new construction project or renovation, make sure you read between the lines. "Lines, what lines?" you say? The lines of a floorplan as shown above! A floorplan is critical to use because it shows where the walls and entryways begin and end in a room or house. Interior designers use architectural floorplans to show you options for furniture placement or built-in cabinetry. For instance, a floorplan can show if there is enough room to easily walk around furniture. 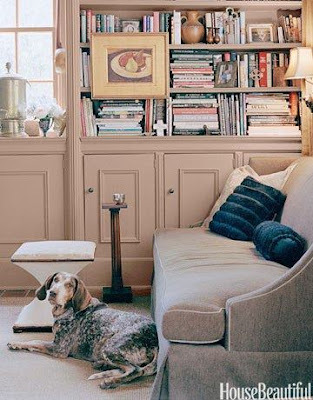 It can show you if there is enough room for two sofas or only one, what size tables work best, or how large a rug should be in a dining room. Floorplans also show you the traffic pattern between rooms. 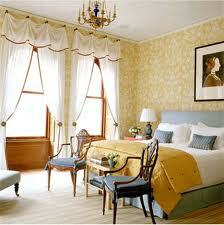 Traffic patterns from room to room should be designed for your lifestyle. The design of the home or office should make sense so that moving from room to room is efficient. Efficient design = less steps. Less steps = more time and more energy spent on the important things in life. When you know how the room will 'work', then you can 'work' the room and get to the fun part of choosing furnishings, fabrics and paint. Floorplans are the foundation to create the most beautiful, comfortable and efficient home or office. Note: if you're restoring your home from damage caused by Hurricane Sandy, read my blog - The Concept Board for articles to help you today, tomorrow or when you are ready to start your renovation. One of the joys of living the interior designer life is being involved in someones fresh start and successful renovation. Sometimes, my work involves a complete re-do and sometimes it's about adding new color, new window treatments or new furnishings such as rugs, pillows or lamps. as a designer as well. While I have years of experience under my belt, there has never been a project, where I haven't learned something valuable to share with other clients. With Spring approaching in a month or so, I feel the urge to spruce up, pare down and add some pizazz to my own home, and so are my clients. To have a beautiful home like theirs, do what they do. Decide to have a fresh start for the promise of a better day, and a happier season. Decide to take on that project that you've been talking about - why not? What are you waiting for and where do you need a fresh start in your home? Help! I need a shower of ideas for this week's blog! It's the weekend, a new week is approaching and once again I'm faced with a number of blog posts to write! I have many interior design topics I could write about, information to sift through and decisions to be made. But, sometimes it's overwhelming! Information is everywhere to be found, but how can I decide what to write about this week? The answer is to do what I do for my interior design clients. I design a plan in steps. Then we can proceed in an orderly manner and get things done. For my blogs, my plan starts with breaking down the week into four days for blog posts. Each day I write on a noteworthy product or a design problem and solution. For instance, this week I might write about bathrooms. I then divide my four days into four products or problems and solutions for bathrooms. Today, I share information about the Roda Tresor shower enclosure. This enclosure has 3/8" glass, with a sculpted handle and is available in the popular finish of oil rubbed bronze (as shown in the photo). See, it wasn't that hard. I went from slightly overwhelmed to satisfied within minutes. 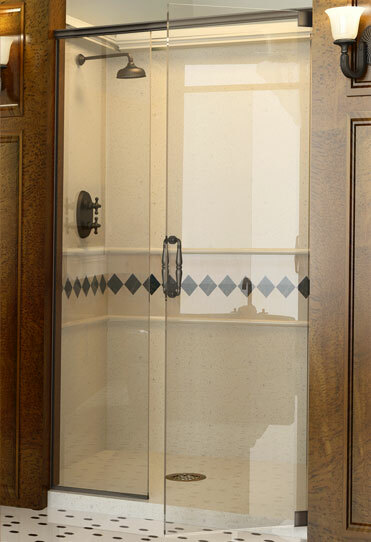 I found a great option for a shower enclosure, if frame-less shower enclosures are not in the budget for my clients. Most important is that I have a plan and I feel in control of my time. That's why planning in steps is so important. It gives you a 'small win' with every step accomplished. Did this idea help you? What are some problems you need to resolve with your decorating project? Call me for a meeting that just might get your project finally on track. Do people still use wallpaper in their homes? Almost every week someone asks me this question. My answer surprises them and the answer is a resounding - yes! In the 'before' people wallpapered almost every room. But, today designers and clients with the most beautiful homes are very selective on where to use wallpaper. Instead of covering walls with busy patterns and borders we use wallpaper to add a classic touch of warmth, character or texture to walls or ceilings. For instance, recently I added grass cloth to a dining room above a chair rail moulding. The walls could have been painted, but adding grass cloth pulled the room together and balanced the soft blue paint that was added to the ceiling. Using wallpaper with a large pattern can add whimsy or touch of class that a room or a wall needs - to make it special, different, alive. Do you have a boring Foyer? 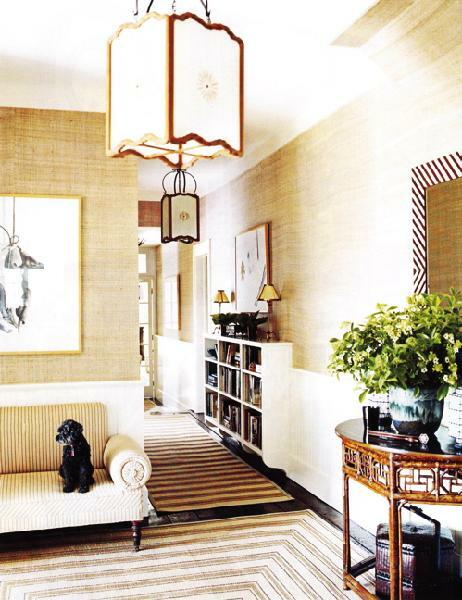 Add a large scale pattern such as a striped wallpaper in beige and cream. If your Powder Room is tiny- use a whimsical pattern or even a large scale pattern in a great color to give the room a feeling of importance. Part VI - What is the most important thing to consider when choosing new flooring for your home? While some might say 'looks' or what's in are the most important things to consider, function and durability are first on my list when choosing flooring for my clients. Whether tile, rugs, carpet or wood flooring, each type of flooring has attributes as well as pitfalls. For instance, tile is often the choice for kitchens because of easy maintenance of the tile. While tile itself is durable, grout can be a problem to maintain in the years to come. Sometimes, wood flooring is a better selection for a kitchen. Rugs and carpet add an element of style to a room but depending on the fiber chosen, the life of the carpet or rug can be short. Is the rug there to protect a wood floor or is it installed in a room that is infrequently used? Durability is a concern for wood flooring too. With all the selections in wood flooring, you would think choosing your new wood floor would be easy. However, there is much to consider in choice of wood flooring, if you vision a floor that will last decades into the future. For instance, can the wood floor be sanded and stained once or more times when it starts to show wear? What is the traffic pattern across the wood floor and will you need a rug or runner to protect it? Will the wood floor get more use when the family grows from two to four or more with children or extended family? Will it be safe for all generations to walk on, especially if they need a walker for support? As you can see, selection is not the problem when choosing flooring for your home. However, selecting your flooring for function and durability are key things to consider to protect and preserve your investment in your home. Choosing your flooring is not about keeping up with the Joneses. It's about selecting the right installation that fits with your life today as well as ten or twenty years into the future.